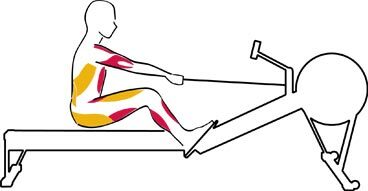 Rowing is a coordinated muscle action that involves every large muscle group in the body. 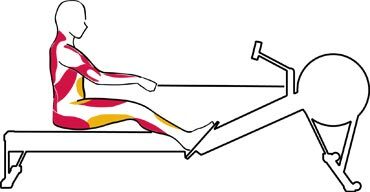 The following sections illustrate the primary muscles used during each movement of the rowing stroke. 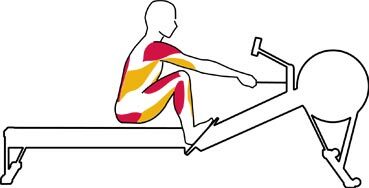 For a more detailed analysis of the muscles used, refer to The Biomechanics of Rowing. At the catch, your legs are compressed and your shins are vertical. Your triceps work to extend your arms, and the flexor muscles of your fingers and thumbs grip the handle. Your back muscles are relaxed, and your abdominals are flexing your torso forward. You initiate the drive with the powerful muscles of your legs, and all of the shoulder muscles are contracting. As you work through the drive sequence, your biceps engage to pull the handle toward your abdomen, your back muscles work more as you swing your torso open, and your glutes and hamstrings contract to extend the hip. As the drive finishes with the arm pull-through, nearly all the muscles of your upper body engage. At the finish, the abdominals stabilize the body, and the glutes and quads are contracting. The biceps and many of the back muscles are also contracting to help keep the torso in the finish position and to internally rotate the upper arms. The triceps engage to push the arms forward and away from the body. 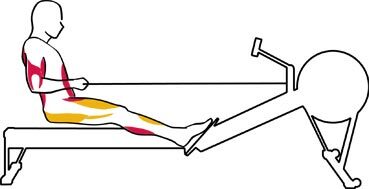 The abdominals flex the torso forward, and the hamstrings and calves contract as you slide up to the catch.